Well-planned, beautiful landscaping is the goal most home owners have for their home and garden areas. We admire perfectly manicured lawns and lively flower gardens during a Sunday afternoon stroll. But how often do we notice or point out the beauty of concrete walkways and patios? Oftentimes, this type of work is overlooked as an element in landscaping, that adds a unique touch to your home. All that stops now! Concrete is amazingly versatile and can be a creative method to add decorative detail to your home, especially on a budget! Stamped concrete is an easier, and less time-consuming method for creating beautiful, multi-dimensional walkways and patios that look very similar to their more expensive counterparts of stones and pavers. After concrete is poured and settled, an experienced contractor uses large stamps from a set of patterns to press the desired decorative look into the soft concrete. Adding a powdered color additive to the mixture before it is poured is another option that creates a beautifully unique element to the finished product. 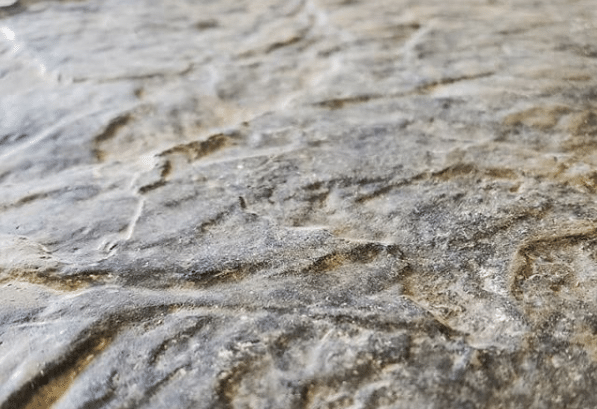 Once the stamped concrete is dried, it can also be sprayed with a color additive; however, this can begin to peel over time. For this reason, many professionals recommend using the powdered additive before pouring the concrete. Another piece of advice is that a good concrete sealer is invaluable to off-set any fading of the coloring over time. It is important to note that while this finish work does sound simple, there is plenty of room for error. It is advised that only experienced contractors or very serious DIY pros undertake this type of project. 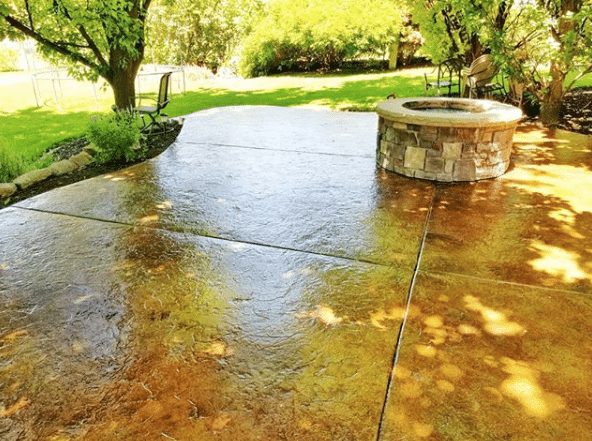 If the concrete mixture has too much or too little water, stamping can be quite the challenge, with many undesirable outcomes such as rough or brittle edges. Using stamped concrete to bolster your landscaping can really add an elegant touch that is considerably less expensive and is also a much faster process. Stonework and pavers can be a long and tedious way to break the bank! Concrete work that is well-designed and poured correctly has proven to stand the test of time and is a remarkable method for keeping weeds and grasses at bay as well. Stones and pavers allow weeds to grow between the joints, creating an uneven pathway. Concrete certainly has the advantage if this is a concern in your yard. As with all good things, there are some drawbacks to consider. There are some stamps that can actually make the concrete be smoother than it might be otherwise. This can produce a slippery affect when wet. To avoid this problem, the use of a non-slip additive can help to prevent this. The stamping texture itself should be considered. This may cause some uneven places that are not suitable for the elderly or small children who are learning to walk. Moreover, these small grooves are likely to cause some patio furniture to wobble slightly if the placement isn’t just right. Snow removal can also be a point of frustration due to the uneven textured surface. Moreover, for this same reason, debris and dirt can become lodged in the grooves more easily as well. If the concreted area will be load-bearing, such as a driveway, it is important to use a stronger concrete mix, or to plan for a thicker slab. Additionally, it may be a good idea to use a textured skin for this instead of an actual stamp, as this will still offer a unique look without creating grooves. Is Stamped Concrete for You? Stamped concrete can be a budget-friendly and creative way to add some elegance to your landscaping. While there are a few special considerations, many find this additional touch to be esthetically pleasing and a durable choice for their home and yard. If you are considering concrete work for your new home or you simply need an outdoor upgrade, stamped concrete can really take your landscaping to the next level.